If the total number of teams exceeds 12, the league may become too cumbersome for effective operation, unless it is divided into two separate divisions. 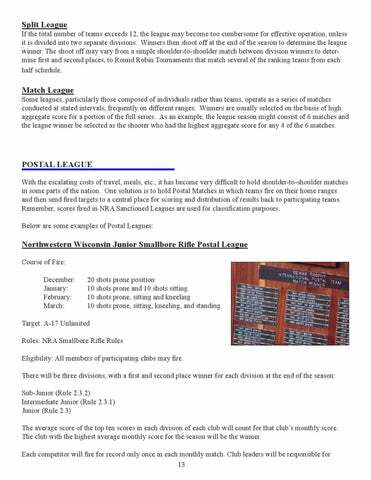 Winners then shoot off at the end of the season to determine the league winner. The shoot off may vary from a simple shoulder-to-shoulder match between division winners to determine first and second places, to Round Robin Tournaments that match several of the ranking teams from each half schedule. Some leagues, particularly those composed of individuals rather than teams, operate as a series of matches conducted at stated intervals, frequently on different ranges. Winners are usually selected on the basis of high aggregate score for a portion of the full series. 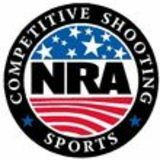 As an example, the league season might consist of 6 matches and the league winner be selected as the shooter who had the highest aggregate score for any 4 of the 6 matches.